ARC received from the publisher via Edelweiss. As I sit to write this review, KISS is scheduled to perform where I live. Being elsewhere at the moment, it appears the opportunity to see the band play live has eluded me once more. I will admit, though, (and not to slight Eric Singer and Tommy Thayer) if the day does come I hope I get to see the original lineup. It would take a miracle, I know, but such sentimentality keeps me from spending money on acts that have replaced key players. When Rush puts Darren Stephens in place of Alex Lifeson, I’ll know it’s the end. On this blog you’ll find reviews of both Ace and Peter’s memoirs. 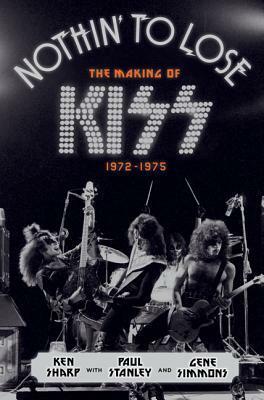 Where these books cover the entire span of KISStory and beyond, Nothin’ to Lose does as advertised: it’s a lengthy eyewitness account of the band’s birth told in the oral history fashion similar to Sharp’s other effort, Starting Over (also reviewed here). While this method of storytelling brings many voices to the forefront, I find this style risks the loss of an objective point of view. The book’s introduction about KISS reads like a gushing fan letter, which didn’t irritate me but did leave me wondering if any unflattering remarks or anecdotes didn’t make the cut under the watchful eyes of Gene and Paul. Nothin’ compiles the memories of a huge cast involved in the band’s genesis as Wicked Lester through their early association with Casablanca Records. More than thirty years after his death, Neil Bogart represents an enthusiasm for KISS’s showmanship and drive through archived interviews – you also hear from early fans (many relatives and close friends of the original members), early road crew, former managers, and other musicians. Yes, I do give them points for an extensive section on the Rush/KISS connection, the Bag Man story, and an amusing picture of Geddy Lee covered in whipped cream that a few people I know will want to see. You might wonder, how are Peter and Ace represented here? They do have voices, though Peter’s contribution to Nothin’ isn’t as large as Gene and Paul’s, and Ace appears less frequently. Nothin’ to Lose offers a view of the early days of KISS with little evidence of in-fighting – maybe a few vocal concerns about drug and alcohol, but otherwise everybody plays nice. This doesn’t mean you won’t find gossipy bits to enjoy; I came away from the book with the perfect Boogie Nights image in my head about Casablanca. Nobody can accuse the 70s of being boring, and despite the healthy size of the book I wanted to read more. 1975, where the book technically ends, marks the beginning of the golden age of KISS. Tales of the humble start, from the tiny clubs and an odd Seinfeld connection, provide a wealth of memories for fans – perhaps this book’s success will inspire a second volume. Kathryn Lively is a mystery author who still hasn’t seen KISS live.